Melissa Marie Mathison (June 3, 1950 – November 4, 2015) was an American film and television screenwriter and an activist for Tibetan freedom. She was best known for writing the screenplays for the films The Black Stallion (1979) and E.T. the Extra-Terrestrial (1982), the latter of which earned her the Saturn Award for Best Writing and a nomination for the Academy Award for Best Original Screenplay. Mathison went on to write The Indian in the Cupboard (1995), based on Lynne Reid Banks' 1980 children's novel of the same name, and Kundun (1997), a biographical-drama film about the Dalai Lama. Her final film credit was The BFG (2016), which marked her third collaboration with director Steven Spielberg. Mathison was born on June 3, 1950, in Los Angeles, one of five siblings. Her father, Richard Randolph Mathison, was the Los Angeles bureau chief of Newsweek. Her mother was Margaret Jean (née Kieffer) Mathison, a food writer and convenience-foods entrepreneur. After graduating from Providence High School in 1968, Mathison attended the University of California, Berkeley. Her family was friendly with Francis Ford Coppola, whose children were babysat by Mathison. Coppola offered her a job as his assistant on The Godfather Part II, an opportunity for which she left her studies at UC Berkeley. With Coppola’s encouragement, she wrote a script for The Black Stallion, adapted from the novel, that caught the attention of Steven Spielberg. Mathison wrote the screenplay for E.T. the Extra-Terrestrial in collaboration with Steven Spielberg. It was nominated for an Oscar for best original screenplay. The screenplay was based on a story that Spielberg provided to Mathison during the filming of Raiders of the Lost Ark. Spielberg attributes the line "E.T. phone home" to Mathison. She collaborated again with Spielberg for The BFG, which was released in 2016. She also had film credits for The Escape Artist and The Indian in the Cupboard. 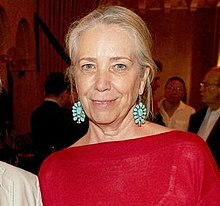 Mathison knew the Dalai Lama from 1990 when she wrote the script for Kundun, and she developed a lasting friendship with him from that time on. She continued to work as an activist for Tibetan freedom and was on the board of the International Campaign for Tibet. From 1983 to 2004, Mathison was married to Harrison Ford; they had two children together. She died on November 4, 2015, in Los Angeles, aged 65, from neuroendocrine cancer. Her final film, The BFG, was dedicated in her memory. The line "E.T. phone home." is ranked 15th among the top 100 quotations of U.S. cinema by the American Film Institute. 1983 Twilight Zone: The Movie Science fiction-thriller Segment 2, "Kick the Can"; credited as "Josh Rogan"
^ "Melissa Mathison". Movies.yahoo.com. April 20, 2011. Retrieved November 4, 2015. ^ "Melissa Mathison: a masterful storyteller who brought ET to life", The Guardian, November 5, 2015. ^ Saperstein, Pat. "Melissa Mathison, 'E.T.' Screenwriter and Ex-Wife of Harrison Ford, Dies at 65". Variety. Retrieved November 8, 2015. ^ Weber, Bruce (November 6, 2015). "Melissa Mathison, 65, Dies; Wrote Screenplay for 'E.T.'". New York Times. Retrieved November 8, 2015.